Williams was outstanding, but his opponent, Cashner, was more outstanding. An unearned run in the second inning pinned the loss on Williams, who retired the next 16 batters after that inning and allowed only three hits. Pounding the strike zone, Cashner allowed a fifth inning bunt base hit to Brown and an eight-inning single up the middle by Byrd in pitching his second complete shutout of the season. The other was a one-hitter against the Tigers in April. Of Cashner’s 92 pitches, only 24 were out of the strike zone. The Padres have allowed 480 runs, second fewest in the NL. They’ve scored 482, fewest. The loss ended the Phillies five-game winning streak over San Diego, dating back to last season. It was the third 1-0 shutout in the majors Monday. Over a span of 15 regular seasons, from 1999 to 2013, the only pitcher to throw a shutout in a 1-0 victory against the Phillies was R. A. Dickey in 2010, but now Cashner and Julio Teheran (on April 16) have done so this year. 14 Times the Phillies have been shut out this season. In the bottom of the 11th inning, Rick Joseph hits a one-out, walk-off grand slam to give the Phillies a 8-4 win over Los Angeles. It’s the only pinch-hit, extra-inning grand slam in team history. 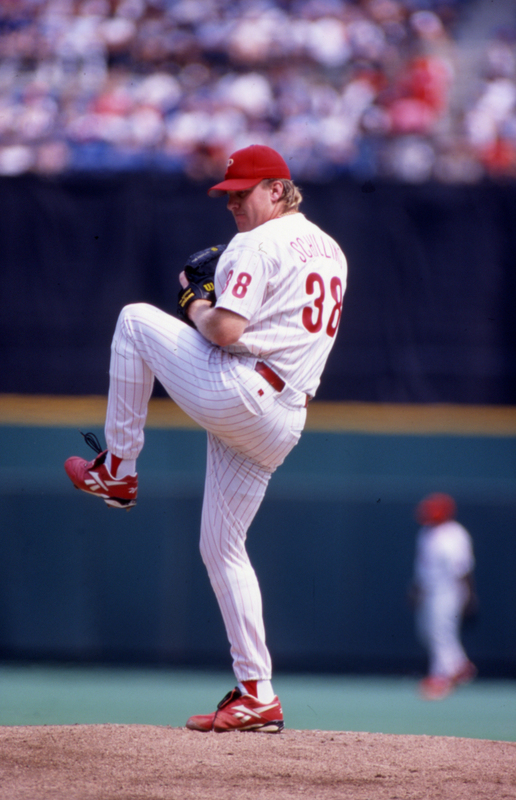 RHP Curt Schilling fans nine in beating the Mets to become the first Phillies pitcher with 300 strikeouts in season and the 13th in baseball history. **Sunday, September 28, Citizens Bank Park, behind section 111, 12:30 p.m.-1:30 p.m.
B and B came through last night. Pat Burrell came off the bench with his second career pinch-hit home run to give us the lead. But, the win really goes to the bullpen of Ryan Madson, J. C. Romero, Chad Durbin, Tom Gordon and Brad Lidge. Combined they pitched scoreless baseball for four innings, allowing just three hits. Not to be overlooked were the three hits by Ryan Howard, who is getting in a groove. The big guy can carry this team on his shoulders when he gets hot. “No lineups?” was a comment posted yesterday. Since I don’t travel with the team, it is more cumbersome to post the starting lineups on the road. We did try on one trip last year but, for a variety of reasons, it really didn’t work out too well. Glad to know the lineups are meaningful to you. Wish there were a simple solution. hitter at Montreal, walking 7 and striking out 10, before 8,833. It just seems as if it was yesterday. Montreal third baseman Tim Wallach grounded back to Greene, who raised both arms in the air, trotted toward first and flipped the ball to Jordan for the final out. Before he knew it, Greene was surrounded by his jubilant teammates. Tommy, a very talkative chap, still dabbles in the game because his son, Seth, is a junior in high school. But away from baseball, he and a buddy are involved in rehabbing homes. Tommy’s also close to getting his real estate license. Once that has been accomplished, he will team with his wife, Lori, who has been a realtor for a number of years.